PVC Roofing - San Diego Roofing Inc.
PVC (Polyvinyl chloride) roofing is a roofing system that has withstood the tests of time. Introduced in the 1960s, PVC roofing was among the first single-ply commercial roofing materials. Often referred to as the first “cool roofing” system, PVC is energy-efficient, environmentally sustainable, long-lasting and cost-effective. PVC is cost-effective over its lifespan due to its long lifespan and energy efficiency. Reduced maintenance, less waste generated from manufacturing and installation, less time and labor for installation, and reduced heating/cooling costs make PVC roofing one of the least expensive roofing options available. 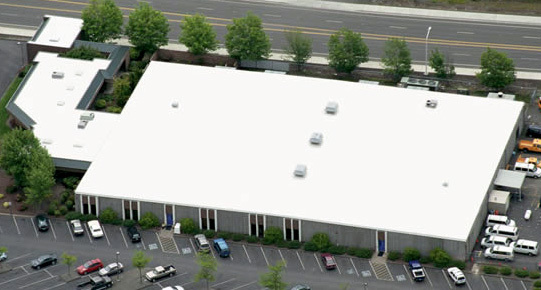 White PVC roofing systems not only reflect sunlight and solar energy to save building owners up to 40 percent in annual electricity costs, they also improve the performance of the underlying roof insulation by 25 to 50 percent; extend the useful life of the roof by as much as 75 percent; enable rooftop cooling equipment to run more efficiently; contribute to better indoor air quality and comfort; and collectively help mitigate the effects of urban heat islands and the air pollution they cause. Only 43 percent of PVC membrane composition is derived from nonrenewable fossil fuel feedstocks, compared with other single-ply and built-up systems that contain a much higher percentage. PVC requires less energy to produce than competitive products. PVC Roofing lasts for 20 to 30 years, reducing the rate of waste flow into landfills. There is virtually no scrap in PVC roof manufacturing or installation. PVC roofs can often be installed directly over old roofs. Many PVC roof manufacturers have post-use recycling programs. PVC roofing membranes are inherently recyclable, and are the only roofing material that can be recycled back into roofing products. PVC roofing causes extremely low contribution to greenhouse gases and hazardous emissions, due to closed-loop manufacturing. There are at least 10 categories in which white PVC roofing systems can help earn points under the LEED rating systems. PVC roofing systems typically last anywhere from 20-30+ years with very little maintenance. PVC’s hot-air welded seams make it extremely durable in all weather conditions and completely watertight, even from standing water. PVC roofing membranes are also highly resistant to fire. A PVC roof is difficult to ignite, will not support combustion, and will self extinguish when the source of flame is removed. Reflective properties extend the useful life of the roof substrate materials by reducing the rate of deterioration by as much as 75 percent. Waterproof characteristics prevent PVC from rotting, rusting or corroding. Mechanical fastening systems enable vinyl roofs to withstand extremely high winds with minimal damage. Custom prefabricated systems from some manufacturers help ensure optimal installation and long-term performance. Heat-welding properties create seams that are stronger than the membrane itself while eliminating the need for chemicals, torches or other hazardous installation methods. Inherent flame resistance strengthened by the addition of flame retardant additives, which facilitates UL Class A ratings and Factory Mutual Class 1 ratings. 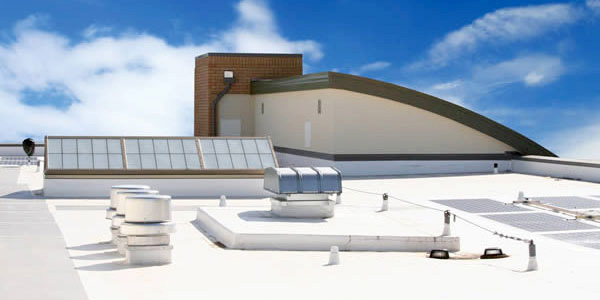 Extremely high resistance to chemicals, grease, and other harmful substances that are common on rooftops. Simple repair procedures normally accomplished by heat-welded patches or seams.